Flexible Move offers moving containers that are perfect for those who have a do-it-yourself attitude and are on a budget. We offer solutions that are designed to make your move faster and easier in a manner that saves both time and money. Our unique methods can also be utilized for temporary storage, making the unpacking and organizing of your new home a little less stressful. If youre looking for a spacious, simple method of relocating, our moving containers are perfect for your needs. With our do-it-yourself containers and qualified, professional drivers, Flexible Move is a revolutionary leader in long distance moving companies for Canadian homeowners. 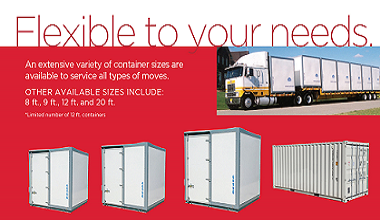 Available in different sizes, our moving containers are better for space and are more cost-efficient. Each comes with blankets, skins and straps for your convenience, with the amount of equipment varying depending on size. You can choose from 8 feet or 9 feet;if you need more than one, no problem  were happy to fulfill your requirements, no matter how much room you need! Our moving containers accommodate the relocation needs of individuals on a tighter budget with less time who prefer the DIY approach. Working with traditional moving companies usually entails renting a truck and driving it to your new destination. This can add problems to the already stressful process of moving, as you may be unfamiliar with the vehicle and route. Its also a less economical option, as you may need to stop at a hotel for a night or two, depending on the distance. With Flexible Move, youll get viable alternatives to the stress and hassle that come with the services of most moving companies. The solutions we offer are safer, more economical and convenient than those of traditional moving companies. Our drivers understand how important your cargo is and are fully committed to ensuring it arrives in a safe and timely manner, eliminating the stress of you or a family member driving a van full of your household goods. We pride ourselves on offering these one-of-a-kind services, designed to bring you peace of mind and make an important milestone in your life as easy as we can. With a network of moving companies with over 50 years of experience, Flexible Move guarantees reliable, quality service. Moving truck rental can be almost as stressful as moving itself. Even after you find one that matches your requirements for space, size, and fuel economy, theres the likelihood that youre unfamiliar with driving it. Then theres the issue of price;driving a moving truck long distance usually means staying at hotels or motels overnight, adding to cost. Using our services instead of moving truck rental guarantees safe transport from experienced drivers, while our three different sizes of do-it-yourself containers give you the space you need to save money. When you use us as an alternative to moving truck rental, we deliver the containers to your residence on a flat bed trailer with two walk-boards for loading. Youre given an eight hour period to get everything stored away, at which point the driver will return to transport your goods to one of our destination centers in your new city. One of our representatives will call you once your cargo arrives so you can schedule a time for unloading;once this is scheduled, the containers will be brought to your new home, once again on a flat bed trailer, and you can begin the process of moving in. Were happy to do our best to accommodate your unique needs and timetable in order to provide you with the best, most personalized substitute for moving truck rental. 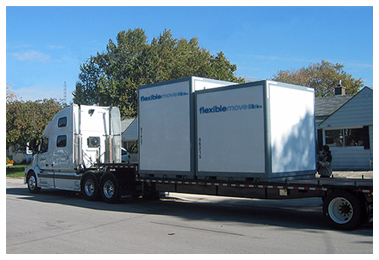 If youre looking for an easier, more economical approach to relocation, Flexible Move is here to help you. Give us a call at 1-866-220-0652 for more information, or fill out our online form to get a quote today! 50 AIR MILES® Reward Miles. © Copyright 2019 Flexible Move. All rights reserved.